OrgThis is a lifestyle blog with organization tips and style/fashion comments. Organization is how to store/display your stuff. Style is more personal - who you are or how you look/feel. Fashion is what you wear - old or new is it you? If you like to read books, check out the books listed in the right column. If you are looking for a certain type of post, scroll down the right column to check out the blog labels for subject matter categories. Diamonds are supposed to be a girl's best friend. Yet they are usually expensive. Why? Because they are regulated and controlled stones, not because they are rare. Diamonds as the hardest gemstone on the MOHS scale at 10. If you love the look of diamonds but want an affordable alternative your could consider a good simulant. However if you want a real gemstone, there are clear alternatives to white diamonds that can give as much sparkle or a bigger look for less. The easiest to find include diamond-cut versions of clear quartz, white topaz, or white zircon. Other more rare (than diamonds for sure) diamond substitute stones include Danburite, Goshenite, Petalite, as well as white Sapphire or Spinel. Diamond simulants might be Cubic Zirconia (CZ with a MOHS of 8-8.5) called by various brand names to either signify a higher quality product or to confuse consumers into thinking they are getting real diamonds. Some of higher quality CZ brands are sold on many shopping channels. These include shopping channels brands of: Absolute (sold on HSN), Bella Luce (sold by JTV), Brilliante (sold on Evine), and Diamonique (sold on QVC). The most well-known non-CZ diamond-simulant for brilliance, hardness (MOHS 9.5), and refraction is Moissanite (sold on all major shopping channels and ins some department stores) jewelry by designers Charles & Colvard, Strotium Titatnate (aka Fabulite) is an older and more rare simulant because it is a softer MOHS of 5.5, however it may be found on a few shopping channels. Clear quartz is the least expensive "real" gemstone that may be used instead of diamonds. These can be found in small to really large settings, as well as in bead forms. Of course no one will believe the really big quartz stones are the same as real diamonds, but it you like great bling - who cares what others may think. It is a relatively hard stone with MOHS of 7. Herkimer is a popular brand for "diamond' quartz but it is not real diamonds. This brand is known for making jewelry that looks like it is rough-cut diamonds. White topaz is often used as accent stones in other gemstone jewelry, although most clear topaz is color-treated as most people want it in birthstone colors or blue or gold. This has been a practice for years to provide the idea of diamonds around or with colored gemstones. Typically this colorless topaz is used for accent. However it can be cloudy or turn grayish if not cleaned often - so it obviously may not look like diamonds to the trained eye. However, higher-quality clear-white topaz is used when it is the primary stone so that it has more sparkle like a diamond. A reputable jeweler should be able to help you compare whether a diamond or topaz is best for you. Ouro Preto "diamond" topaz done in a multi-facet diamond cut is an excellent choice, if the stone is not too large. Topaz is not as refractive as diamonds and has a MOHS of 8, so it may scratch if stored with diamonds. White zircon is relatively new as accents stones for colored gemstones. It is seldom used as a diamond solitaire type ring, but it can be found if you look. White zircon is rarer than diamonds but not nearly as expensive! 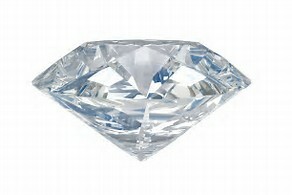 It has ever more sparkle than a diamond, which is why it is growing in popularity although it has a lower MOHS around 7. This is the actual gemstone that inspired CZs, but zircon is a real stone and cubic is a simulated version. Other genuine gemstones stones to look for include Petalite (aka castorite), Goshenite (white beryl), colorless Danburite, White Sapphire and White Spinel. The rarest and most beautiful of these would be Petalite, but it is easily scratched at a MOS of 6-6.5. Goshenite may be the next rarest sometimes it will look blue in sunlight as it is related to aquamarine. Goshenite was used as a diamond substitute before creation of CZs and has a MOHS hardness of 7.5-8. Danburite may be the hardest to find, its MOHS falls between Petalite and Goshenite at 7. The white sapphire is a lovely diamond replacement option and comes close to the diamond hardness, since sapphire have a MOHS of 9. In most jewelry stores, their white sapphire will be lab-grown rather than naturally occurring. Spinel is growing in popularity at a MOHS of 8, but the white spinel variety is the rarest find. Jewelry stores may not sell most of these rare gemstones, so check shopping channels for them if interested in pricing and purchasing. This list is not all the clear, white facet-able gemstones that exist. .There are others that are even more rare which were not included as they will be very hard to find set into jewelry. Anyone that wants to recommend another diamond-like gemstone may add it by putting a comment on this post. Thanks. Fourteen Cookie Decorating Hacks Plus Seven More! The below video has 14 clever ideas for making your plain cookies look more fascinating using common kitchen utensils and other everyday objects in the first 3 minutes. After that is 7 more recipes/ideas for making unique desserts or cookies are presented in the last 5.5 minutes. 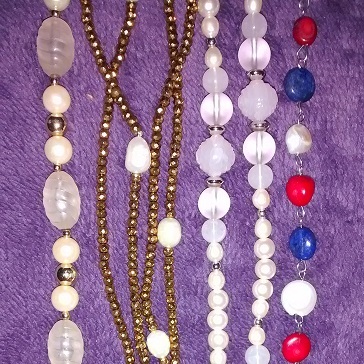 In other posts, new fashionable up-to-date looks with pearls included mixing with chains and chips or varying sizes/colors/shapes. The newest hot look is to take pearls and mix them with either round opaque gemstone beads for a soft look. Or to create a more dramatic look by mixing pearls with faceted beads to give them a bling effect. The most fashionable necklaces are long so that they can be used in a multitude of ways to create various looks for different occasions. Check out jewelry designers (see Dallas Prince and Victoria Wieck) and on-line sellers current choices for faceted beads with pearls include smaller sizes of hematite (plain or plated) and spinel on shopping channels. Same size, smaller, or larger smooth bead choices range from soft colors of rose quartz or milky aquamarine to darker gems like garnet on these sites as well. Asian designers have been mixing round jade beads with pearls for awhile and that style continues to grow in popularity, especially jade from Burma. If you have checked out the food option for this blog, you know we make a lot of soups because they are usually quick and easy. The last few months have been perfect soup weather. As a result we have tried out some richly flavored soups that use Velveeta Cheese as their base. Below are links to some of the recipes we tried and like well enough to make again. If you have tried any of these soups and have improvement suggestions or have another recipe you would like to recommend we try, please provide that in the comments of this post. 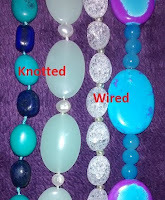 If not knotting, you can consider wire instead of cord for stringing beads to produce a necklace that may not have to be restrung later (cording eventually frays and breaks). Using different sizes of wire for bead types will require purchasing crimp beads to use near clasp to keep wire from coming loose and provide a finished look. Do not just pick a pretty clasp or toggle for your project, instead choose the best clasp and crimp for each jewelry project. For more jewelry making tips, see my posts on Jewelry Creation and Repair Tips and Images plus how to videos in How to Repair a Broken Link in Chain of Necklace and How to Repair or Make a Stretch Bracelet. For bead and tool shopping tips and warnings, consider my posts Beads and beading are the IN things to do, Gem Shows or Bead Stringing Heaven and Gem and Jewelry Show Two. Do you want a fashionable handbag that is different form everyone else? Do you like hand-made items that have that one-of-a-kind look? Do you know someone who loves carrying a new purse evyerday? Then you may be interested in the leather handbags by Anuschka or Sukriti for yourself or as gifts. There is a newer option for hand-painted leather bags, accessories, and belts called Sukriti. It is also made in India but only sold via shopping channels (ShopLc.com) for about $100 less than the above options.. The Sukriti brand produces multi-color scenes similar to Anushka but with an ombre effect on many of their purse handles. The newly purchased Sukriti leather purse options typically come a dust-cover bag as well, Sukriti also has another line called Vivid, which is dyed pattern brand rather than hand painted images. You can see a tour of the Sukriti factory by going to this video. Another leather handbag option that is not Sukriit on this shopping channel is woven bags under the brand Chaas by Elsie. Both Anushka and Sukriti guarantee that their dyes will not run/bleed or transfer onto your clothing. If anyone reading this blog has a comment regarding quality of either brand to share, please add a comment to this blog post to help others make the best decision. Pantone color of the year for 2019 is called Living Coral. The color name is an attempt to bring thoughts of nature and the environment into our lives (see prior colors for 2016-2017 and 2014 or 2011). Coral is a vibrant, yet soft pinkish-orange. 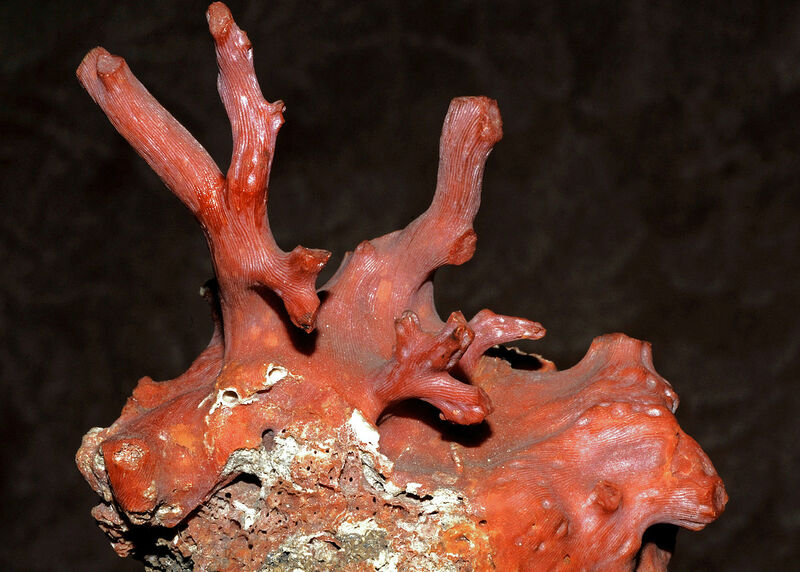 It is the color most think of when they hear the word coral. CORAL is the color that invokes thoughts of cameos for jewelry lovers, although most will think RED for a coral bead necklace. It is an easier color for many people to pull off than the bright tangerine choice of 2012. Check out coral or go lighter by adding peach for home decor, office supplies, and fashion (see Vogue slideshow). If you are interested in knowing about the different types of coral, see short read on Corals vs. Sponges. Gemstones Rarest vs. 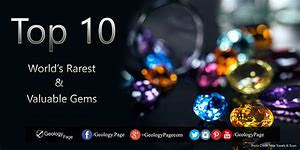 Most Expensive - Top Ten Gems? I thought it would be interesting to find out what the most rare gemstones are. When searching I found lots of varying opinions, which I assume were due to the posts being different years and newer discoveries or older mines playing out. Some considered one-location gemstones rare even though the site may produce tons of stones. There were also differing opinions on which were the ten most expensive, some of the confusion being caused by sites counting down 10 to 1 or up 1 to 10. Values were based on what the store sites were selling stones for or the current appraised value - so always search for current year pricing. Diamonds showed up most lists, although they are not RARE, they are usually the most expensive because they are the hardest gemstone and are very refractive. 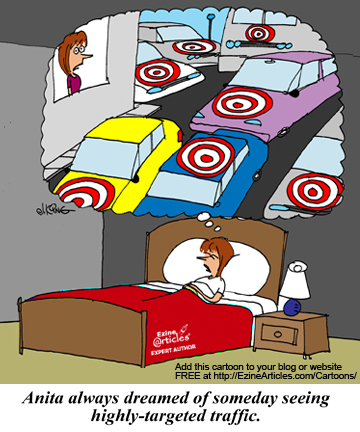 I tried to find an infographic I could use, but the ones I liked were copyrighted. Under expensive also included were Emerald (green beryl), Ruby, and Sapphire. Under rare included were Poudretteite and Grandederite. Below is a list of the best links I found that contain either great photos of the gems or the most detailed information. Trauma and Drama - What do you see as a Christmas story? A different view of the Christmas story from Luke 1:26-2:39 in the Holy Bible was presented by the pastor of Victorious Life Church from the perspective of the earthly parents of Jesus. Below are quotes from part of his sermon, the words in brackets are mine to help explain the preceding word. Takeaway: "What we've been given [Salvation through Christ] is greater than anything we go through." The Oak Ridge Boys Christmas, Celebrate Christmas, Christmas Time's A-Coming CDs/LPs. Keep Christ in Christmas with a Capital C, not an X? I often hear people complaining about Xmas replacing CHRISTmas. Ok, I understand they think that example is taking Christ out of the holiday by shortening the official holiday term for marketing purposes. However, the way it was explained to me is that the X is also called a cross, so that is supposed to keep Christ in since He died on the Cross. (See also The X In Xmas Is Really About Jesus Christ.) So are we supposed to read Xmas aloud as CROSSmas? Not the merriest/happiest or most thoughtful phrase for a birthday celebration. Also, I got to wonder why was MAS (formerly Mass) was left in the term, as it implies a religious celebration? Now the all-inclusive advertising/PC phrase has changed again. Instead of "Merry Christmas" we are supposed to say "Happy Holidays." Didn't the word holiday from from Holy Day? (See also Happy Holidays: How Did We Get to This?.) Some believe the reason is so retailer could lump Halloween, Thanksgiving, Christmas, and New Year together for a longer selling timeline (noticing more Santa/Snowman decorations come out in October this year). Isn't that moving even further from the reason for the season? JESUS is the REASON for the SEASON of Christmas! We are told this in the Go Fish song and comedy routine "Christmas with a capital C". Below is video of just the singing part along with the song lyrics printed out. See also post Where did all the Nativities go? 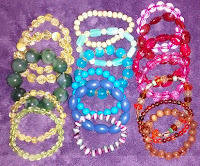 To find out more about blogger, Shirley Lee or to contact her, go to ShirleyFineLee.com. DISCLAIMER: By accessing this blog site, you agree that your use of this web site and content provided are made available and used at your own risk and without our liability. The owners and contributors of this site make no warranties of any kind, whether expressed or implied, related to content, products, or services offered via this site or sites that hyperlinks displayed on this site may take you to.